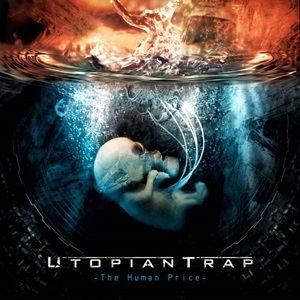 Utopian Trap originally started from the Bay Area as Fiction in the mid 2000’s, before changing names and band members to settle on a progressive/ heavy metal style with Utopian Trap. The Human Price is the quintet’s second album but first for this scribe’s ears, an eclectic seven song mixture of various progressive metal and rock leanings that ensures a dedicated listen every time out. Organically developing some classic/doom-oriented aspects to the adventurous structures and overall performances, often see-sawing simplicity in one facet for the intricacies of another. The title track opens the proceedings- a bold choice because it’s the longest cut at 9:53, but well worth it due to its doom/hypnotic strains throughout and an equally intoxicating vocal delivery from Eric Boles, making me feel like we are checking out Psychotic Waltz if thrown through a bit of Memento Mori’s classic textures. Two instrumentals “Verge” and “Atephobic” appear in succession – the former more of a progressive metal affair with an addictive guitar harmony hook running throughout while you get a lot of supplementary technical tricks and time signature changes in the rhythm section, while the latter emphasizes the bass proficiency of Farhan Mohamed as he slaps and pops in a number of jazzy, free floating mannerisms that prove he’s got high caliber, emotionally driven taste. A heavier song like “The Final Figure” showcases more of their love of Dream Theater and Symphony X but also nods to some of the thrash bands in their own area, especially in terms of the crunchy riff choices from guitarists Chandra Garud and Vinod Bhat. Eric’s voice is a key difference-maker to the good for Utopian Trap – it has that deep, rich resonance that differs from a typical progressive singer who loves to stay in upper reaches. “Walls of Justice” for instance has a lot of James Rivera-oriented mid-range to slightly higher notes, but then will be more playful during the verses in lower capacities. Along with a guitar tone that’s got a darker Zakk Wylde vibe, The Human Price has enough originality and diversity to gain a lot of wide reaching followers not just on the progressive side, but the classic doom/heavy metal audience also.